Josh DeWeese is a ceramic artist and educator. He is an Associate Professor of Art teaching ceramics at Montana State University in Bozeman, where he and his wife Rosalie Wynkoop have a home and studio. DeWeese served as Resident Director of the Archie Bray Foundation for the Ceramic Arts in Helena, Montana from 1992-2006. He holds an MFA from the New York State College of Ceramics at Alfred, and a BFA from the Kansas City Art Institute. DeWeese has exhibited and taught workshops internationally and his work is included in numerous public and private collections. I am interested in how pots can be used every day to bring art into our lives, enhancing our experience with food, adorning our homes, and providing a necessary ritual to nourish our soul and mind as well as our bodies. I try to make pottery that is successful in several ways: comfortable to use, enjoyable to look at, and interesting to think about. I’m drawn to the beauty and mystery of high temperature ceramics and the element of chance that occurs in atmospheric firings. Wood firing and salt/soda firing are processes where extreme surfaces can be achieved, in the subtle qualities of raw clays and the vibrant depths of a running glaze. I have a passion for painting with ceramic materials. I enjoy the phenomenon of the melt and the element of gravity that enters the image through running glaze. The loss of control is important, blurring the lines made with the hand. 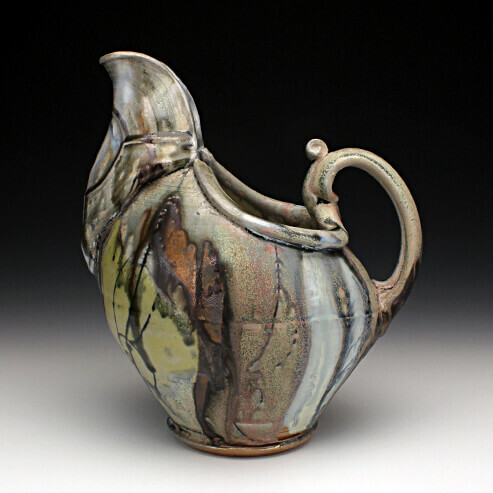 The viscosity and movement of the glaze becomes an important element in the final image. I am interested in translating what I see in front of me, whatever it may be. Any view may serve as a still life to respond too. Many of the drawings are sketches of my studio or the view out the window. Images of pottery in my studio often dance across the forms I am glazing. The drawings often disappear among the layers of information that become the final surface, creating depth and a sense of curiosity. Perhaps pottery’s greatest power lies in its association with the human body. The language of pottery is the language of the body, with necks and feet, bellies and shoulders, and lips to touch our lips. The intimate relationship that develops with use strengthens this association. A personality develops, and the pots become our friends. In this friendship they become reflections of our humanness, and help give meaning to our lives.